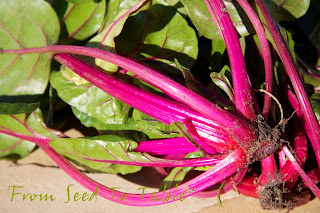 I'm joing Liz over at Suburban Tomato with a Saturday Spotlight post about one of my favorite varieties of chard (aka silver beet). This is the second year that Flamingo Chard has had a place in my garden and it is certainly earning that place. In year one it performed adequately in spite of getting a rather late start and having to grow in a position where it had to fight with invading oak tree roots for water and nutrients. Look at these poor little plants on April 4 of 2012, the first year that I grew this variety. They didn't get much of a chance to get established before the winter because I sowed the seeds on October 21 of 2011. It's amazing that they grew as well as they did. Poor things, I didn't get around to thinning the plantings until February 9 of 2012! They never did get a chance to get much larger than seen above, I had to clear out all the plantings in that bed to transfer the soil to the neighboring new and much improved raised bed. Not that they would have gotten much bigger anyway, they were probably getting ready to bolt. The next round was sown on August 13 of 2012 which gave the plants a chance to get well established before they had to contend with the cold short days of winter. Here they are just planted out into the garden on September 27. The white containers are place holders for a couple of Golden Chard seedlings that were not quite big enough to plant out yet. And here are the plants today, 6 1/2 months after setting them out. Wow, what a different story from the 2011/12 planting. I have harvested 6.25 pounds of stems and leaves from these 2 plants and there's a lot left. It all has to go in the next few weeks. It's hard to tell in the photo below, but the plants are just starting to develop an elongated central stem which means that they are ready to produce flowers. And that pole that is planted in front of the plant above is there to mark out the turf for the second planting of climbing snap beans that I have planned for a few weeks from now, I will be attaching a trellis to the two poles that are straddling the chard patch. I think that the whitening stems are also an indicator of flowering, that's a very recent development in the coloration. At the moment the chard is one of the few vegetables in the garden that is producing a crop. The other overwintered vegetables are gone, other than the favas and garlic, and neither of those are producing yet. It is very nice to have something fresh from the garden at the moment. 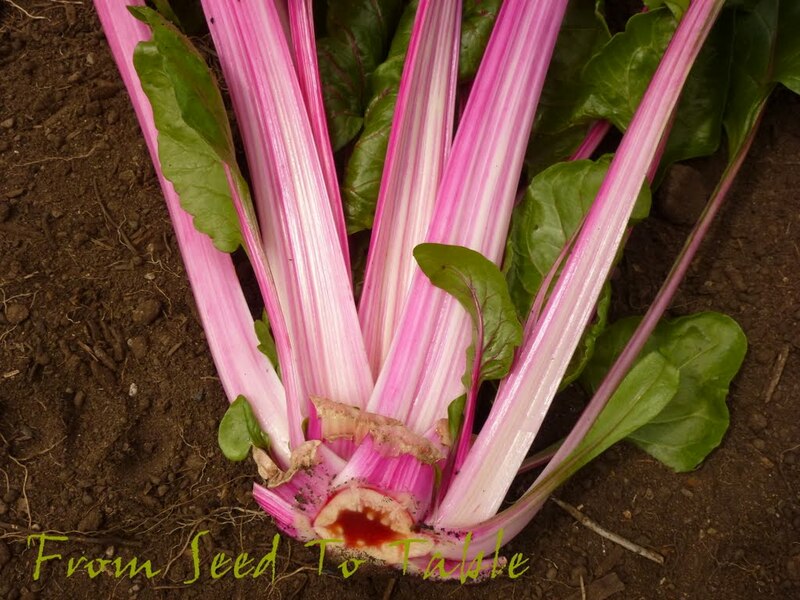 I could sow another set of plants right now if I wanted to, chard will grow beautifully through the entire year in my climate but I don't bother with a spring sowing for two reasons. First, I just can't be bothered to battle the leaf miners all summer long. Here's my latest harvest of Flamingo chard (note that I whacked off one whole side shoot!). You can see that the miners are already attacking and the infestations will only get worse as the season gets on. The other reason I don't bother with a spring sowing of chard is that I just don't need it. There's such a bounty of vegetables from the spring and summer garden that I rarely get around to harvesting any of it, the space is better used to grow something else. Flamingo chard is an open pollinated variety and there is some variability in its growth and coloration. Take another look at the photo of the plants that I took today - a few photos back - and you can see that one plant has fairly flat leaves and the other has leaves that are more crinkled and a bit larger. The flat leafed plant also tends to throw off more side shoots, you can see where I chopped off the side shoot above and below. That red core on the stem is rather interesting. That side shoot came out to 1.9 pounds after I trimmed it down to just the edible parts. I've not been able to figure out if Flamingo qualifies as an heirloom (whatever that designation actually means). Some seed catalogs give it that designation, others don't. It is widely available, a web search turns up numerous seed purveyors that carry it. 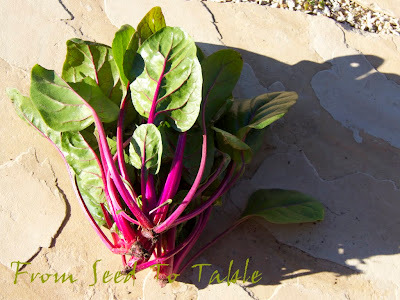 One of the qualities of this chard that I love is that that beautiful magenta pink does not bleed and color the whole dish when you cook it. The color stays vibrant with brief cooking but will fade with longer cooking. And the flavor is mild as chards go. I much prefer it to the red stemmed varieties for both the non-bleeding feature and the milder flavor. Here we have problems with terminology; as Eleanour Sinclair Rhode noted in her Uncommon Vegetables (1946, 55), chards are the blanched stalks of young globe artichoke leaves. These are prepared in cookery, like cardoons. This should not be surprising, since chard is a corruption of the French word for cardoon. So it is in England, but in this country, chards are the leaves of a certain type of beet that British gardeners refer to as the Silver Beet or Sea Kale Beet. Americans have long since forgotten that "Swiss Chard" originally meant Swiss cardoon, one of those curious euphemisms like "Jerusalem artichoke" (page 167) that has little to do with botanical reality. The Silver Beet or Sea Kale Beet (the chard of America) is mentioned by John Parkinson in his Paradisus (1629). this is a variety of chard with a thick white stem. As I have already mentioned, this type of beet has been known since classical antiquity, and its ancient name, cicla, is of Punic (Phoenician) origin. In old garden books it is often referred to as a "white beet", which can be confusing since there was a white-rooted variety of common table beet. Ottavio Targioni-Tozzetti (1825, 34) referred to chard in his Italian botanical dictionary as beta cicla or bietola bianca (white beet); this ambiguity was not limited to English alone. 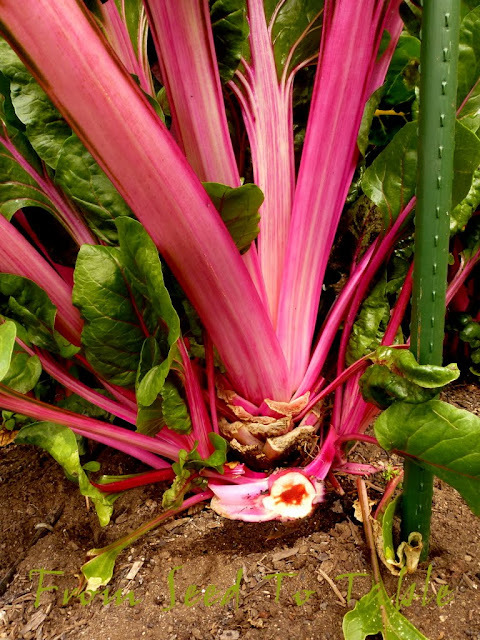 Furthermore, the French added their own layer of confusion by referring to chard, especially the red and yellow varieties, as Chilean beet (poirée à carde du Chile). Another tidbit that I gleaned from the book is that all the chards with colored stems (those so-called Chilean Beets) were all developed by crossing white stemmed chard (Swiss Chard) with beets that had very colorful leaves. 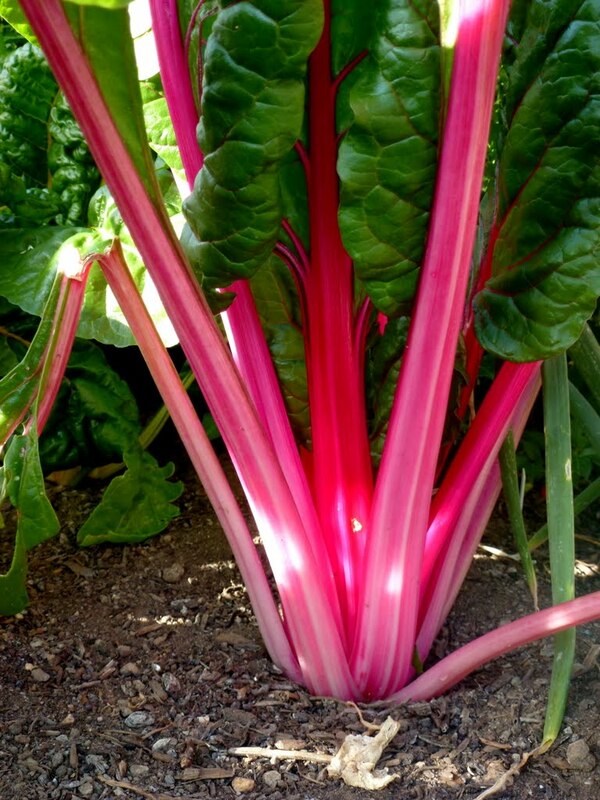 So, I still don't know who crossed some beets and Swiss chard or when they did so to come up with the eye-popping Flamingo chard, but I love the results and this chard will be a feature in my garden for seasons to come. Vilmorin listed what we call silverbeet in 1885 as Chilian Beet, identifying it under just three colours — the bright red, deep yellow and white stalks. Apparently the other two colours of orange and pink were unknown to Vilmorin then. Vilmorin is unfailingly observant noting that their silvery beet (sea-kale) is "more productive and being quite free from any trace of earthy flavour. In these plants a light and pale colour in the leaves appears to be accompanied by a mild flavour while leaves of a dark green colour have always a strong acrid taste." During Diggers comprehensive grow-outs to ensure purity, farm manager Dr. Will Trueman had identified twelve colour variations depending on whether they were dark leaved or green leaved, and whether leaf stalks were bi-coloured with pink tinges along the ribs. Exactly when this wild plant deviated into a sweet, swollen beetroot is difficult to ascertain so we need to depend on literary accounts that first refer to silverbeet in Babylonian texts of the 8th century BC. Now labelled as Five Colour Silverbeet it holds an important place as the poster child of the Australian heirloom seed movement. In 1993-95, during our extensive grow outs of over 500 heirloom vegetable varieties, this particular strain (originally from New Gippsland Seed Farm) caught the eye of Seed Savers Exchange farm manager David Cavagnaro. So we grew large quantities for export to Seed Savers Exchange in Iowa, USA, and it became the lead line in their first home gardeners catalogue. During repeated trips to American seed trials Diggers staff had naively gifted seed to American seed merchants only to subsequently find the seed strain renamed Bright Lights and under the control of Johnny's Seeds. 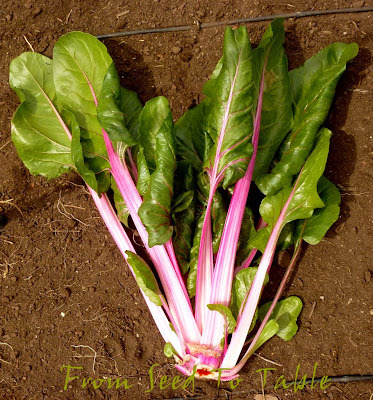 How do you prepare chard? After admiring your Flamingo chard last year, I purchased seeds and my starts are now under the grow lamps. The Flamingo and Orange Fantasia chard are scheduled to go into the raised beds in a couple of weeks. I have no choice but to grow my chard in the summer. Nothing survived last winter's brutal weather, not even the kale. At least the chard will grow from spring until hard freeze, and leaf miners are a minor problem so far. Nice variety; thanks for sharing. I keep thinking I ought to like chard more than I do, given my mad love affair with kale, but so far have resisted. Maybe this fall. Miners are an abomination in my garden. That sounds like a wonderful chard (or whatever you want to call it). I like the more mild varieties. That is why I grow Argentata which is a white variety. I do miss the pretty colors of the stems though. My favorite color in the garden is the golden variety. So pretty. What a beautiful chard. The way the stems whiten and variegate is very pretty, too. Interesting note about the name. This year, I moved away from the colored chards for a bit to try Verde de Taglio chard. It's coloring is subtle, variations on the theme of soft green, but it is amazingly tasty. The leaves are both substantial yet tender, and the stems are slender so it all cooks evenly. I'm really enjoying it. The red chard is particularly gorgeous! I have been a fan of the mix variety "Bright Lights" for a long time now. I get some yellow, orange, red, pink, and white chard out of the single planting and they are not only delicious but beautiful in my garden too. My hens have decided that the spring growth on my overwintered crop is just about manna from heaven. They make a beeline for it every time I let them near the garden area. Great tidbits about chard — no wonder Liz refers to them as silver beet! The reference to Sea Kale beets further confuses me... something different than Crambe maritime?